Albany’s Dave Clark Path will be much brighter at night — and presumably safer — once the city goes ahead with its plan to install new lights along the riverside trail and in Monteith Riverpark. How much brighter? Well, take a look at the video taken during a demonstration Thursday night of just how the fixtures would work. Benton Electric, which earlier had volunteered to work out a lighting plan, temporarily put up two of the proposed fixtures designed for linear lighting on the path near the Deluxe Brewing, and then two others providing all-around area lighting in the riverpark. 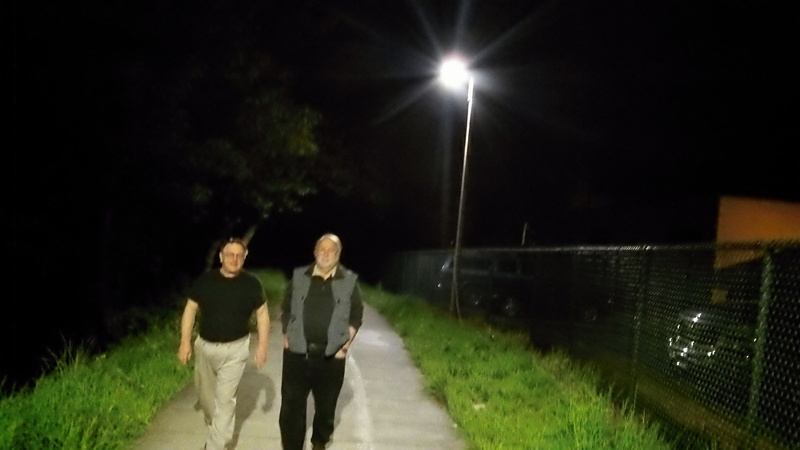 Councilors Rich Kellum and Floyd Collins check out the lighting during Thursday night’s demonstration. The Central Albany Revitalization Area advisory board, which includes all members of the city council, agreed on March 18 to ago ahead with the lighting project but still has to work out exactly how to carry out the procurement. That may come at the group’s meeting in May. The plan presented in March called for 94 16-foot poles (set on bases for a total height of 18 to 20 feet), 72 fixtures of one kind, 22 of another, plus four wall fixtures and one for a restroom. The cost was cited as $269,245, including $179,227 for installation. The poles on the path would be roughly 80 feet apart and support LED fixtures. Each fixture is rated at 138 watts, but the LED’s — about 40 in each fixture — make it look as though it could light a stadium. The light is white, said to be helpful because it lets people, including especially the police, recognize colors. The installation will replace fixtures that emit an unfocused, yellowish light. Wow! Sorry I was unable to attend. The smiles say it all. Jim, I use that path often during daylight hours and I must agree with Hasso in that I rarely see any “characters” on the path during the day that are a particular cause for concern. I’m not so sure about after dark. The lighting is good yet it seems it could have been incorporated into the new development…which would have taken care of approximately half of the distance under this proposal. Missed opportunity there, CARA. More bang for the public buck since we’re basically giving the money away. In my view, since it’s our tax money, CARA money might as well be spent for something such as this than the “forgivable loans” that we hear so much about for developers that have the resources and wherewithal to fund these projects without CARA help. I LIKE the LED type lighting for it’s efficiency so at least they’re doing it correctly. Doesn’t mean I approve of CARA or the concept, but it seems were stuck with it until it expires and we might as well get all the bang for the buck we can. Just think, what if CARA funded the bulk of the Public Safety bldgs. proposed. I could get behind that. I can’t help but wonder if this lighting project meets CARA goals…….regarding return on investment? I think the lighting is great and will make the path much more user friendly into the future. After all, isn’t Albany’s future what CARA is all about! I mean, compared to 10 plus years ago when every waterfront park and pathway and bank was filled with the homeless, that path is already much safer – this will only add to the safety of all users.